Really, I have Cartoon Sara to thank for this one, especially since she spent such a long time trying to convince me to give this show a chance. But here we are, a year and an awful lot of resistance later, and it turns out she was right. Mystery Inc. is pretty darn great. The strange thing about it is that I don't even like Scooby Doo. I grew out of it very fast, and it was always something I watched as a kid only if there wasn't anything else on. It was too formulaic, and when they tried to update it for the nostalgia crowd by making live action movies, I found myself even more confused by its popularity. Well except Matthew Lillard. He was born to play Shaggy. It kinda creeps me out. Good on you, Hollywood Casting Person! 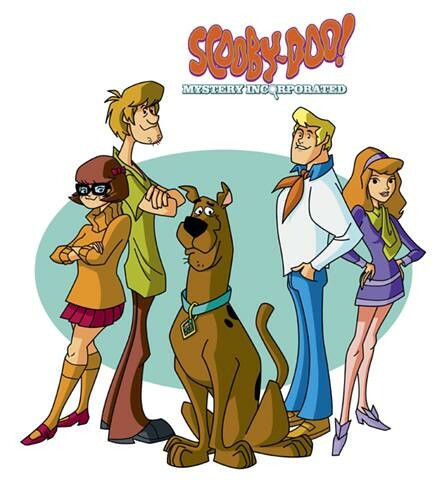 The eleventh Scoody-Doo incarnation, Mystery Inc started airing in 2010 on the Cartoon Network. Before ending in 2013, the series would last for two seasons clocking in at an impressive 52 episodes. Happily, both complete seasons are available on Netflix as well as for purchase on DVD. There are a lot of things that make this show stand out when so many of the other more recent incarnations fall flat. First, the gang is back in their original outfits. I know that sounds silly when there are those of us who didn't even know that they ever wore other outfits. But it does count for something when you are trying to describe how well this show both revels in the colorful retro look from which it came, but also manages to modernize it to avoid any feelings of awkward staleness. Velma's a bit less frumpy, Daphne still has her way of always standing with her hips out, and most importantly Fred has his ascot (I know you were all thinking about that ascot). The elements are there and everyone's childhood memories of Saturday morning with the gang remain in tact. Mystery Inc. introduces two elements never before seen in a Scooby-Doo cartoon – character development and story arcs. Don't worry, you still get your monster of the week and the ever important “And I would've gotten away with it too, if it weren’t for you INSERT EPISODE THEME APPROPRIATE ADJECTIVE kids.” But now you also get larger mysteries involving the history of Crystal Cove (the town where the series takes place) and actual relationships between the members of the gang. Apparently, friendships can get complicated when you're a teenage sleuth. For me, the addition of larger stories and developed characters creates a much more engaging watch than just having something on while blogging or checking your email. They make a show something you actually want to watch. The humor doesn't fall flat in this series either. It's a mixture of corny and clever. Mystery Inc. is most entertaining when it shows self-awareness of its own tropes and colorful history. It doesn't hurt that there are surprise cameos and team-ups from Hanna Barbera's colorful catalog of cartoons past. As I often like to do when I am begging friends and strangers on the internet to check out something I think is cool, I'll give you one last reason to watch Mystery Inc. 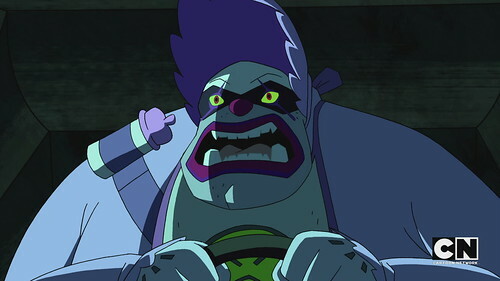 This show is overflowing with pop culture and horror movie references. So many in fact that it even got a few surprised chuckles from The Boy. So if you are charmed by Lemarchand's box popping up in a cartoon or get excited when a lounge singer starts crooning “Words Get Stuck in My Throat,” this might be the very thing for you to choose for your next Netflix streaming marathon. To sum things up, it really is a shame that Mystery Inc only lasted two seasons. The more elaborate and sometimes complex storytelling and retro design used for this series has created something familiar, but new. In my opinion, that is the perfect formula for a reboot or re-imagining. Give us what we know (and in some cases love) but elevate it a bit while respecting the source material. Oh, and don't take the whole thing too seriously. Sounds like a pretty tall order huh? Well, this show got it. So can we please have more of them? So, have any of you guys seen Scooby Doo! Mystery Incorporated? If so, what did you think? Or maybe you just want to tell us what hidden gem you've discovered lately? Tell us in the comments section below!